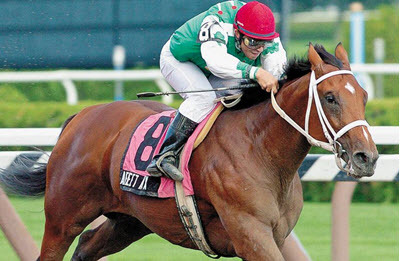 Afleet Alex is a throughoubred who, in 2005, won both the Preakness Stakes and the Belmost Stakes. His story is that of the “ugly duckling” who turned into a handsome bay colored 16 hands stallion with a commanding presence and $2,765,800 in race winnings. In his short but amazing career, Alex started in 12 races of which he won 8, came second in two (both G1 stakes), and finnished third in one (the Kentucky Derby). Of his eight wins, three are G1 stakes and three are other stakes. After being diagnosed with avascular necrosis in a leg, Alex was retired from racing in late 2005, and he has been enjoying a successful stud career since then. Afleet Alex was foaled on May 9, 2002, at John Martin Silvertrand’s farm in Florida. 24 hours after his birth his mother became seriously ill and could no longer nurse him. Fortunatelly, the illness didn’t break out directly after foaling, so she had been able to give him colostrum. Silvertrand’s 9-year-old daughter Lauren fed Afleet Alex milk from a Coors Light bottle. The bottle feeding continued for twelve nychthemerons until a nurse mare had been located. Silvertrand sold Afleet Alex at auction as a yearling. Allegedly, the price was $150,000, but this has not been confirmed. A year after being sold for the first time, Afleet Alex was sold again in the Fasig-Tipton Midlantic May two-year-olds in training sale. The price was $75,000. Broke his maiden by 11 ¼ lenghts on June 26. Won an allowance race by a dozen lenghts on July 12. Won the Sanford Stakes at Saratoga by 5 ¼ lenghts in stakes record time on July 29. 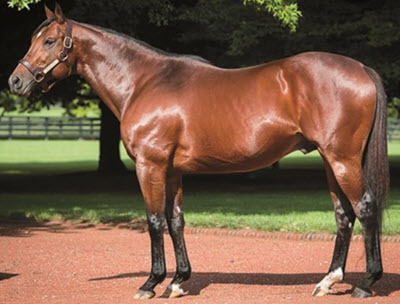 Afleet Alex commenced his three-year-old season by winning the listed Mountain Valley Stakes at Oaklawn Park, running six furlongs in 1:09.52. His next race was the Rebel Stakes, where he – for the first time in his career – finnished out of the money. This soon got its explanation, when a veterinarian diagnosed him with a lung infection. After healing from the infection, Afleet Alex ran the G2 Arkansas Derby and won by a record 8 lenghts. On May 7, he finnished third in the Kentucky Derby, less than a length behind the winner Giacomo. Two weeks after the Kentucky Derby, Afleet Alex won the Preakness Stakes at Pimlico. (This time, Giacomo came in third. )The Preakness Stakes race became very dramatic when Scrappy T, which was in the lead, received an aggressive whip smack from his jockey and swung out at the top of the stretch, veering into Afleet Alex’s path just as he was making his move. The two horses clipped heels, and Alex stumbled and very nearly went to his knees. His jockey Jeremy Rose (which rode him in most races) was thrown far over his neck, and Alex’s nose came within an inch of the dirt, but Alex did a remarkable recovery and continued the race, eventually winning it with a 4 ¾ length margin to Scrappy T.Alex’s time for the Preakness Stakes (distance: 1 mile and three-sixteenth) was 1:55. He ran the final three-sixteenths faster than any other horse had done throughouth the history of the Preakness. On June 11, Alex won the Belmont Stakes by seven lenghts. He rated behind the pace for a mile, but then sped up and passed everyone – including Giacomo – in the final turn. He ran the final quarter (:24 2⁄5) of that race faster than any horse since Arts and Letters in 1969. In late July 2005, a hairline fracture was discovered in Alex’s front cannon bone, near the ankle. When the fracture was fully healed, Alex returned to the Breeder’s Cup Classic where he put in two bullet works. After that, Time Ritchey decided to let the colt rest from races for the rest of the year to be on the safe side. Later in 2005, Alex was diagnosed with avascular necrosis, which is a condition where tissue in the bone has died and become brittle. It is very possible that Alex sustained a deep bruise when he nearly fell at the Preakness Stakes, and that this injury eventually casued both the hairline fracture and the necrosis. On December 1, Tim Ritchey and Cash is King Stable announced that Afleet Alex would retire from his racing career. After retiring from racing, Afleet Alex became a very sought after sire. When he started his new career at Gainesway Farm in Kentucky in 2006, the initial stud fee was $40,000. Ten years later, he was still working as a stud, charging $12,500 for each successful live cover breeding. By then, he had sired 13 graded stakes winners and 7 Grade I winners in the United States. Alex has also sired successful offspring outside the contiguous United States, including a Puerto Rico Champion colt and the Japanese Stakes winning mare Better Sweet. Generally speaking, Alex’s progeny have a high stamina but must be given time to mature to show their full potential. His Preakness Stakes victory was voted “Moment of the Year” by the National Thoroughbred Racing Association. Afleet Alex is named after his sire Northern Afleet and after the principal owner Chuck Zacney’s son Alex. The multiple Grade 2-placed Unforgettable Max is a full brother of Afleet Alex. Alex’s paternal grandsire is Afleet, the 1987 Candian Horse of the Year. Alex’s maternal grandsire Hawkster is a world record holder on turft at a mile and a half. Alex’s maternal granddame Qualique won the 1983 Demoiselle Stakes (G1). Qualique’s sire Hawaii was a marathon turf specialist. Through Qualique, Alex is a direct descendant of Sir Gaylord, a half-brother of the legendary Secretariat. Through Afleet, Alex is a direct descendant of the outstanding breeding stallion Mr. Prospector. Horse racing in Delaware © 2019 All Rights Reserved.